In Being Audrey Hepburn, Clarissa Explains It All-creator, Mitchell Kriegman, tells the story of a 19-year-old girl from Jersey who finds herself thrust into the world of socialites after being seen in Audrey Hepburn’s dress from the film Breakfast at Tiffany’s.Lisbeth comes from a broken home in the land of tube tops, heavy eyeliner, frosted lip-gloss, juiceheads, hoop earrings and “the shore.” She has a circle of friends who have dedicated their teenage lives to relieve the world of all its alcohol one drink at a time. Whoever wrote the summary above is absolutely right. This book reads like a combination of The Nanny Diaries and The Devil Wears Prada. It was a fun read that was so visual I could see it happening in my mind. 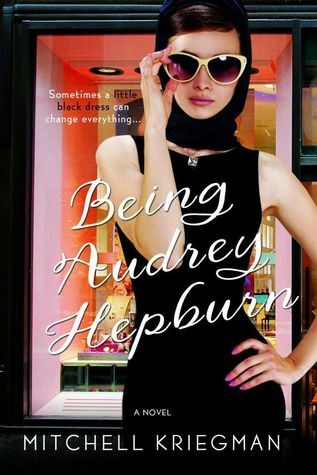 If you are not a fan of fashion, this may not be a book for you. This is a book that describes each outfit that Lisbeth wears in a loving fashion. It gives us each detail and accessory that Lisbeth wears and even gives us a bit of history with the designers. This is a book for fashionistas absolutely. Though I am knowledgeable about fashion, to be honest, I don't really care. I did enjoy the excitement the characters gave about fashion though- you could honestly tell the characters, and perhaps even the author genuinely cared about the subject. This book was never really about the romance, although it is in there- it centers on Lisbeth's needs to be who she isn't and live how "the other side" lives. It was an incredibly interesting look. The characters seemed a little stereotyped (though never living on "the other side... aka rich" I don't really know how they act for real.) I do know, though, that this book would translate beautifully to tv and would be an interesting show to fill the Gossip Girl hole that is evident on TV. This was a fun book, that I enjoyed reading, but I can't say it is one I will read over and over again. I do hope, though that they put this on tv- I would enjoy reading it.